The Community Foundation of Huntsville/Madison County and Torch Technologies today announced the creation of a new endowed fund which will provide a perpetual source of grants for improving quality of life in Huntsville and Madison County. The new fund, called the Community Catalyst Fund, is an endowment to be funded by unrestricted gifts which will empower the Community Foundation to make annual grants for the betterment of the community. The Community Foundation, in its fifth year of operation, has raised or managed over $13.6M in charitable donations since inception, and has distributed over $3.4M to nonprofit agencies, churches and schools in our community and elsewhere. The foundation also provides educational, networking and capacity building services for the nonprofit organizations that benefit from our donors grants. Founded in October 2002, Torch Technologies, Inc. (Torch) is an employee-owned Small Business dedicated to quality technical services, competitive costs and ethical business practices. Torch was the 2005 winner, a 2007 finalist, and a 2009 repeat winner of the Better Business Bureau’s Torch Award for Business Ethics in the North Alabama Region. Torch was nationally recognized by Entrepreneur Magazine in July 2006 as one of the 100 fastest growing companies in America. 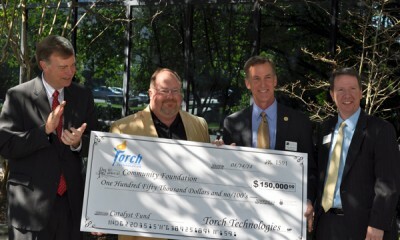 Torch won the 2007 Huntsville Chamber of Commerce Small Business of the Year award in the Technology Category. Also in 2007, the INC5000 ranked Torch as the number one Fastest Growing Privately-held Defense Contractor in the Southeast Region. Torch has been ranked in the INC5000 for seven consecutive years. In 2008 and again in 2012: Torch was named a winner of the Huntsville Best Places to Work award. Torch was selected by Inc. Magazine and Winning Workplaces as a winner in the 2011 “Top Small Company Workplaces” national competition. In 2008 the Alabama Information Technology Association Selected Torch Technologies, Inc. as Large Business of the Year “Leadership in Technology Award”; and the Principal Group named Torch “One of The Principal 10 Best Companies for Employee Financial Security” nationwide. In 2013, Torch was recognized by the Small Business Administration as “Small Business Prime Contractor of the Year” representing the eight southeastern states in SBA Region IV. on Friday, 15 August 2014.